The DXGN14000 is run via a Honda GX630 engine. The engine displacement is 688cc. The unit has an oil alert to keep you apprised when the oil is low. This model has an electric start, as well as a USDA spark arrestor, and it can run for 7.8 hours when at 50% load. The max AC output is 14000 watts and the rated AC output is 11700 watts. This unit’s fuel tank can hold 10 gallons of gasoline and comes with a fuel gauge. It has a 12 volt backup battery. The DXGN14000 offers a 120/240 AC voltage and a 60hz frequency. Pneumatic wheels on this model make it easy to transport. Upon purchase, this unit has a 3-year, limited warranty. When you need some extra power with you on your way to work, The DEWALT Dxgn14000 / Pd123mhb008 Portable Generator could be the handy little tool for you. This generator is small, but never underestimate it; it is plenty of power to keep the professional contractor, or any person working with tools at home, running. When you need to power tools, lights, and other equipment, bring this generator with you. The DEWALT Dxgn14000 is handy, portable, and has plenty of power for your smaller tasks. Make the most of its 14000-watt max AC output and the 11700-watt rated AC output. This little generator’s engine is a Honda GX630, with a displacement of 688cc and an electric start. When it gets going, it will run for 7.8 hours at 50% load capacity. The fuel tank holds 10 gallons of gas. A fuel gauge lets you monitor that gas level, too. This unit gives you 120/240 AC voltage of power at a 60hz frequency for the tools you need on the job. All of these features make the DEWALT Dxgn14000 the perfect worker’s companion. There are plenty of other uses, too. Take it with you when you go to a work site, or keep it in your workshop at home. You get a 3-year limited warranty upon purchasing this model. The DEWALT Dxgn14000 is ready to go home, or to work with you. 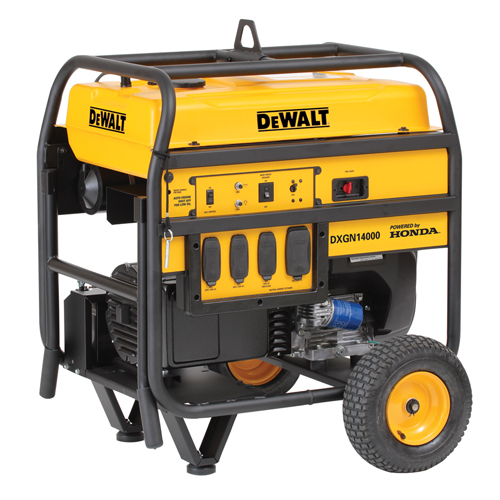 For more questions on this model, other DEWALT generators, or all the models we have in our inventory, contact us at Nationwide Generator today. First fast S/H, And Free. Also Phil & Joe know there stuff. The Dewalt is a nice Gen. Quiet, Powerful, Love the Honda Gx630 motor. Like the oil drain, Half twist valve it's great. Electric start. 50, 30 amp plugs 20 amp plugs. 30, 50, 20 amp breakers. Nice big double handle. LG. Wheels. Made my 50 Amp cord today, And 50 amp breaker plug for my whole house breaker panel. All in #6 gauge wire. Only 1 down fall, To add oil to the Motor, it's well a challenge. It's under the gas tank. I used a funnel and a 1 ft piece of clear hose attached to the bottom of the funnel. Bend it to put in the Oil filler in the top valve cover. 1.7 qts. With filter, 1.5 qts. Without oil filter. I only gave 4 Star cause of the Oil Filler Issue.